vide bezel less smartphone in mid-price-range. Bigger 6.23inches screen smartphone with front glass, aluminium + Plastic body with Gorilla Glass 5 protection. 1.Back of phone is very glossy and get many fingerprints as soon as you touch it. Oppo F7 is largely famous for their cameras and this device is no exception here. The selfie camera is one of the best in the phone’s price range. The phone looks quite premium with elegant design. It does come with an iPhone X like notch. When it comes to audio, the speaker is loud and clear, it falls somewhere between perfectly fine. Since it is mid-range smartphone, you cannot expect much from it. Oppo F7 is a mid-budget smartphone which clearly focuses on selfie users. It comes with wide displays and less bezels on the sides, This is one of the elegant looking smartphones and I really love the design and body factor here. Watching movies on this smartphone becomes a delightful experience. If you want a mid-range device meant for selfie lovers and do not want to compromise on style and performance then this device is for you. The Oppo F7 looks great and feels very premium in hand. Display and sound quality are awesome, Everything is perfect with the product so far. The display is undoubtedly one of the main talking points in the Oppo F7. The display settings come with the option to adjust the color temperature of the screen. The most emphasized feature of the Oppo F7 is the camera the AI based camera works really well. Notch cut off some information placed on top. 20 Pricebaba users have written their experience with Oppo F7. 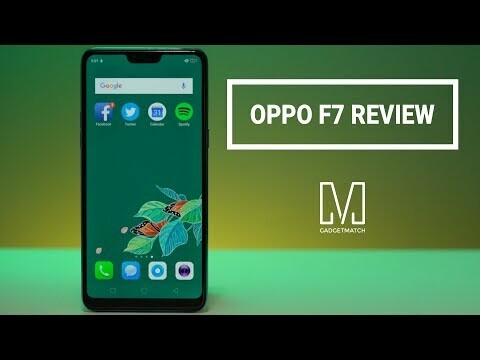 If you own Oppo F7, please do leave your feedback too. Lowest price of Oppo F7 price in India starts at Rs. 18,990 Oppo F7 is available on Flipkart at Rs. 21,500 and on Amazon at Rs. 18,990. Prices updated on 25th April 2019. Even though the F7 is priced higher than other mid-range phones, it still comes with a plastic build quality that doesn't feel so premium. It is available in two different colours: Moonlight Silver and Sunrise Red. The display bears a 'notch' on the top similar to iPhone X and a bunch of other Android phones. It has a 6.23-inch large display with a resolution of 2280 x 1080 pixels, this brings the pixel density to 405 PPI. The display has also got a Corning Gorilla Glass 5 protection on top. On the rear, there is just a single camera instead of a dual-camera setup. There's a 16-megapixel sensor on the back that can click decent pictures and makes use of software tricks offered by Oppo. The biggest highlight of the phone is its superb 25-megapixel selfie camera. It's the best selfie camera you can expect in a smartphone of this stature. You can also use Oppo's AI beautification modes to make your selfies look better. The rear camera also allows for 4K video recording. The Oppo F7 gets a Mediatek Helio P60 octa-core chipset coupled with 4GB of RAM. The specifications ensure that the multi-tasking experience is smooth. It runs on Android 8.1 Oreo out of the box which is quite appreciable, however, Android is layered with Oppo's custom ColorOS 5.0 which might not please stock Android lovers. There's 64GB internal storage in the phone but it can be expanded by using an external microSD card up to 256GB. The phone draws its powers from a 3400mAh battery unit but unfortunately, there is no fast charging support in here. It has got a Micro USB port for charging the phone, there's a 3.5mm headphone jack along with all the other connectivity options such as Wi-Fi, Bluetooth, 4G and VoLTE among others.